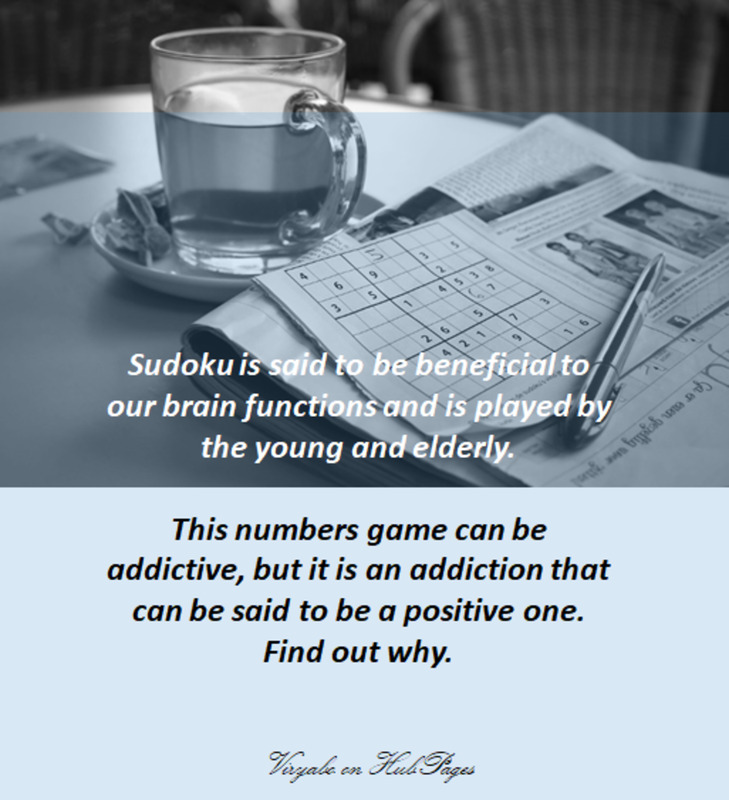 If you're a sudoku enthusiast like me, you probably have come across two types of sudokus. Those that are too easy and those that are way too hard. It seems like there's never anything in between. However, I've recently come across a few strategies to help organize my thinking when I'm searching horizontally, vertically, whether thinking "in the box" or even "out of the box" (a metaphor for the more advanced sudoku techniques). Things often get a lot more exciting the better you get at them, so I hope these tips reignite your sudoku solving experience! 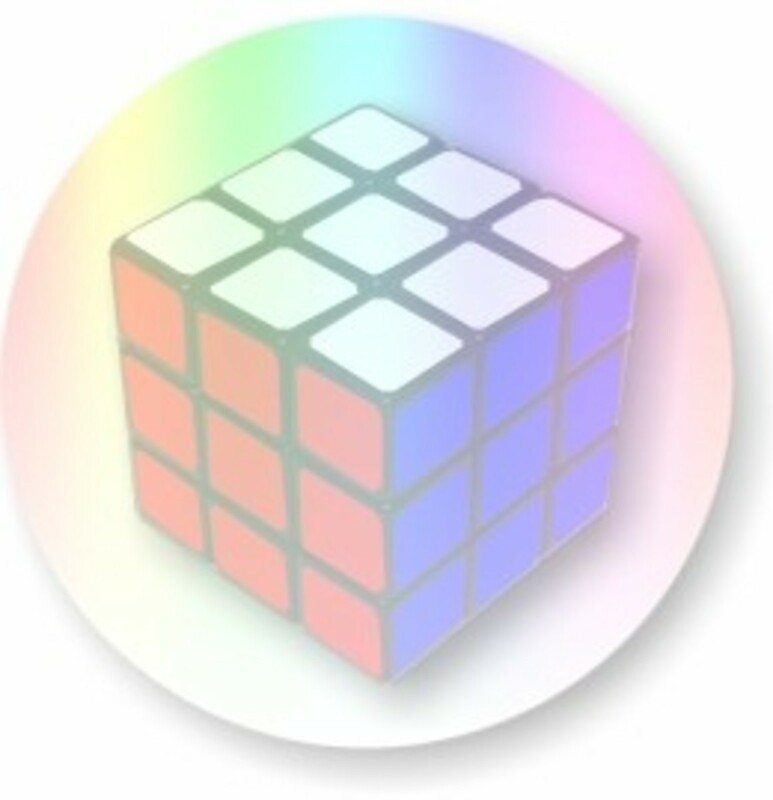 This tutorial is primarily for intermediate solvers who have done a few sudokus here and there and are looking for an extra weapon in their arsenal to solve the slightly trickier puzzles. one thing to note is that you should be especially confident in the skills at the beginner level before attempting these intermediate skills, as these skills are only really used if the beginner tactics have been used and exhausted in the puzzle. 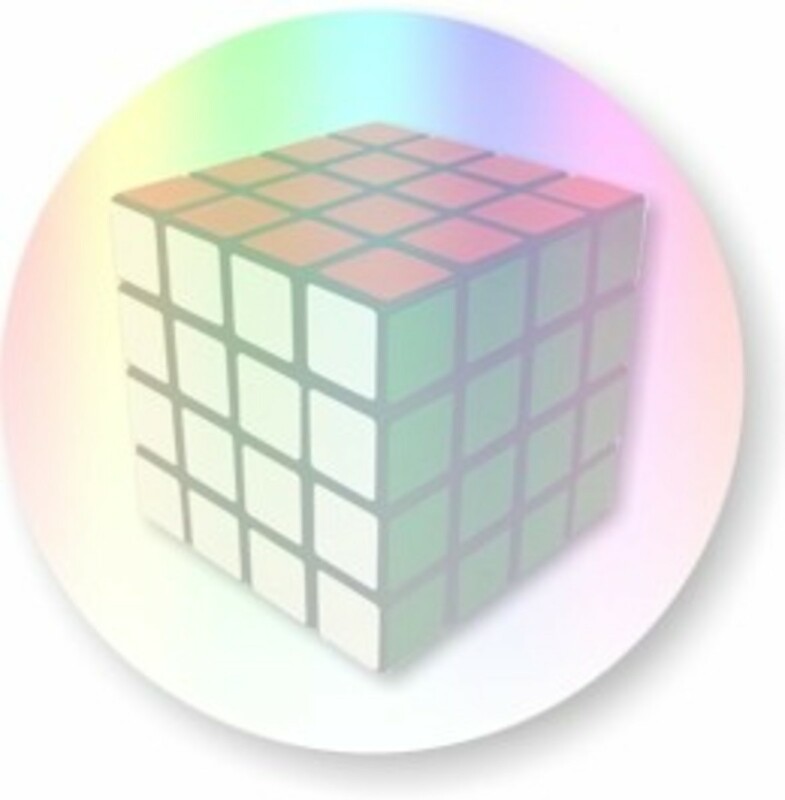 Most intermdiate puzzles use a majority of the beginner rules and a few intermediate steps here and there to bring the puzzle up to the intermediate level. If you feel confident with this skills, you can try taking a look at the advanced hub in this three part series. 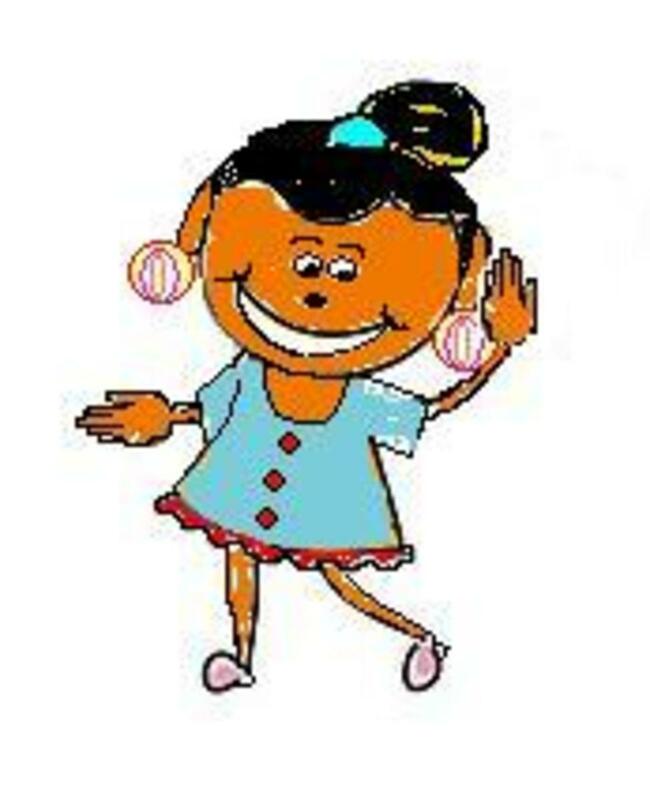 The sub-group exclusion rule is quite useful, and you have probably applied it without knowing it at one point or another. 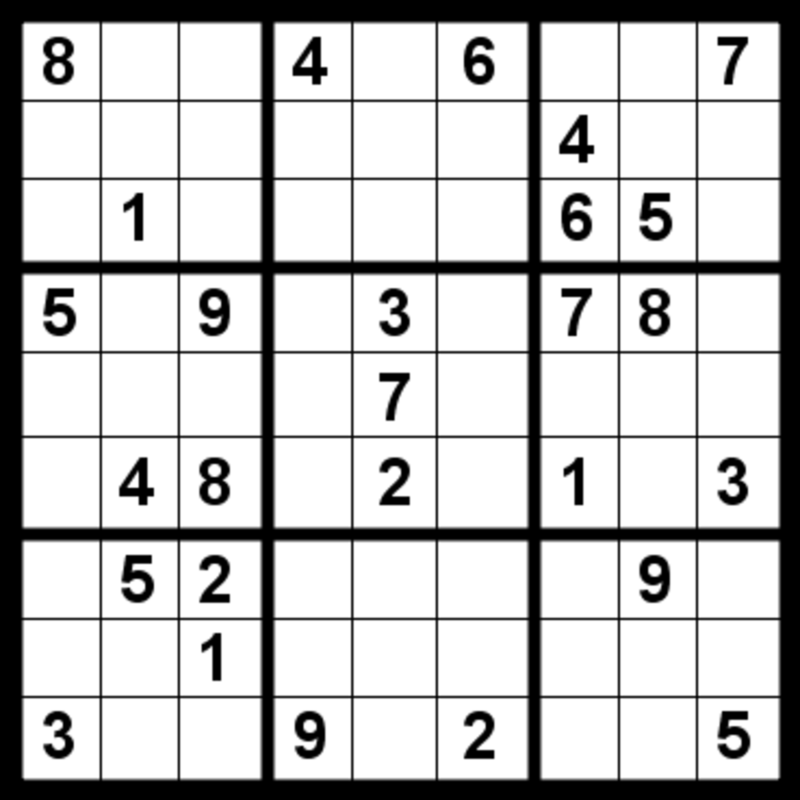 A subgroup is a collection of three squares in a row or column in a sudoku region (box). In the picture to the right (picture 1), in the upper left box, there are three columns that are subgroups (purple, red, green), as well as the three rows A, B, C. Every square belongs to one row and one column (two subgroups). This strategy is applied when you prove that a number must be in one subgroup and not the other two (you won't necessarily figure out which square it's in, but it should narrow down your possibilities). If you know that a number is in a particular subgroup, you can ignore that number as a possibility for the other two subgroups. Look at the row F. The number 5 can only go in the 'd' and 'f' spots since the other spots already have 5 in their column. Thus, 5 can only be in the central box for row F, which almost begs us to apply the subgroup exclusion rule. 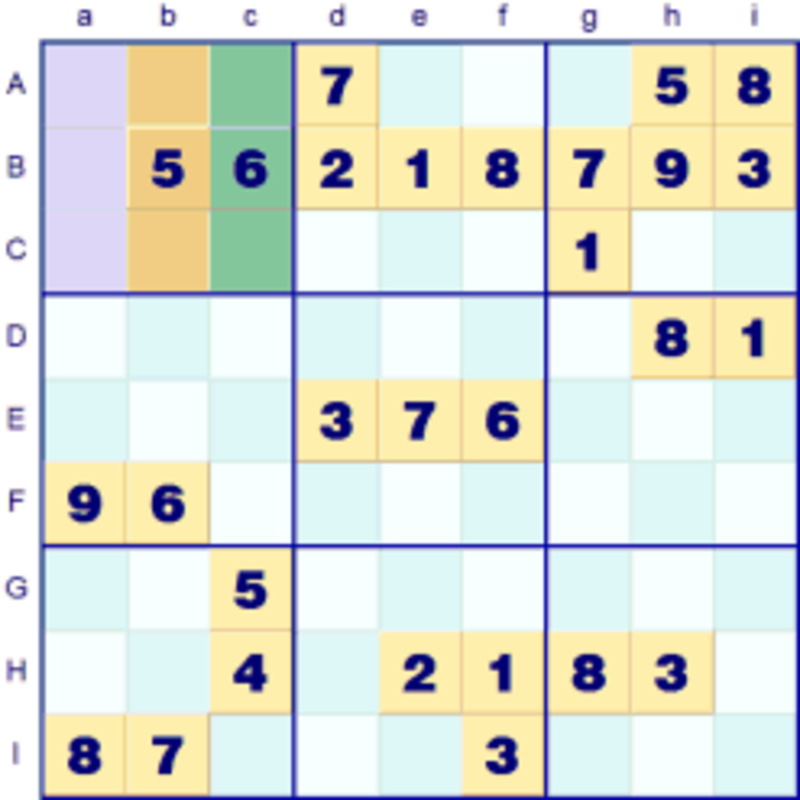 In the central box, since there must be a 5 in row F, there can't be a 5 in row E, so we eliminate it as a choice for each of the squares in row E. This eliminates a few possibilities that is critical to solving the sudoku even though no squares have been completed. As a slightly more difficult exclusion rule, it should be applied after subgroup has been exhausted. For this rule, you must find a situation where two numbers can only go in two particular squares. Although we don't know which number goes in which, we can eliminate any other numbers that were previously choices for the twin squares. You can also apply this rule for triples (three numbers can only go in three squares in a region, eliminating any other numbers). 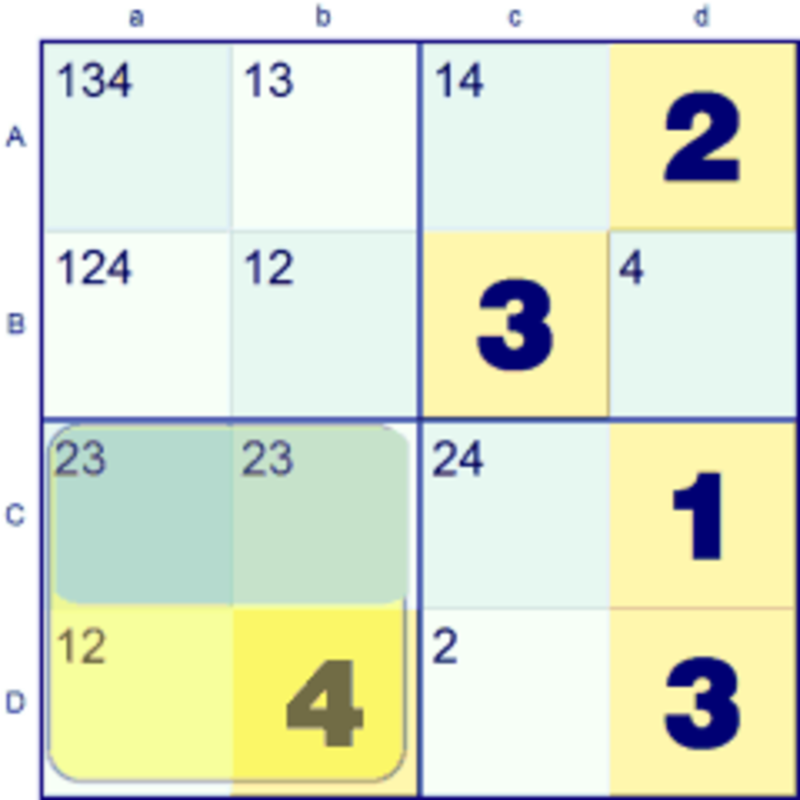 In the picture below (Picture C), you can see a simplified 4x4 grid for demonstration purposes (numbers 1-4). Look at the upper left box, where 2 & 3 must go somewhere in the region, but can only go in column 'a' since column 'b' already has both 2 & 3. Thus we have two twin squares 'Aa' and 'Ba'. This means all other choices can be disregarded (1 & 4). You can see that this elimination is pivotal to solving the entire puzzle ('Ac' eliminates the possibility of 2 in 'Aa', so 'Aa' must be 3). The lonely twin rule can be used to eliminate other possibilities in the same row, column or box as the twin. This is most times the logical next step after applying "Hidden Twin" and similarly can be applied to triples. A lonely twin is observed in Ca and Cb. This twin prevents 2 & 3 from being in their row (since this twin is oriented along a row) or the box. Thus we can eliminate 2 from 'Da' and 2 from 'Cc' (which solve those wo respective squares). That's it for the article. Try applying these rules to your sudoku solving. 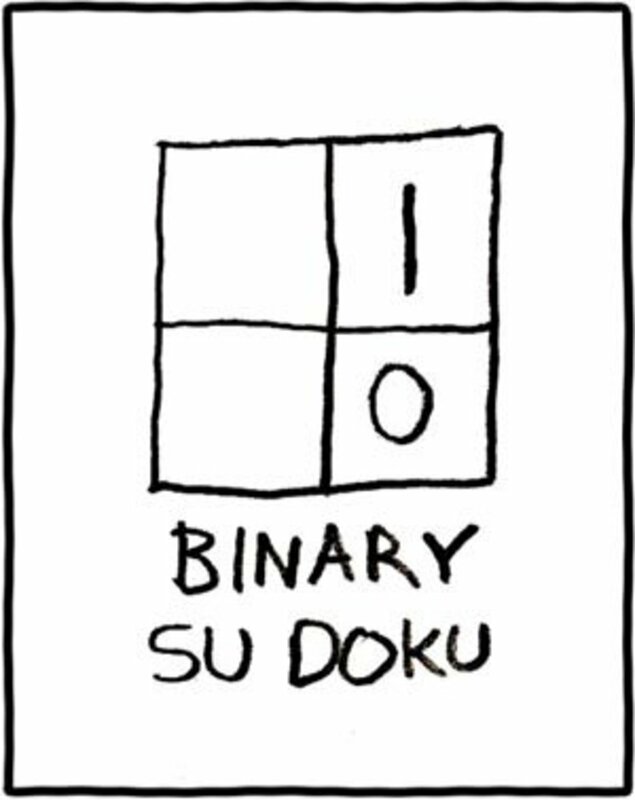 It might take a while for you to get use to them, but it's absolutely necessary for the intermediate and advanced sudokus. Happy solving! 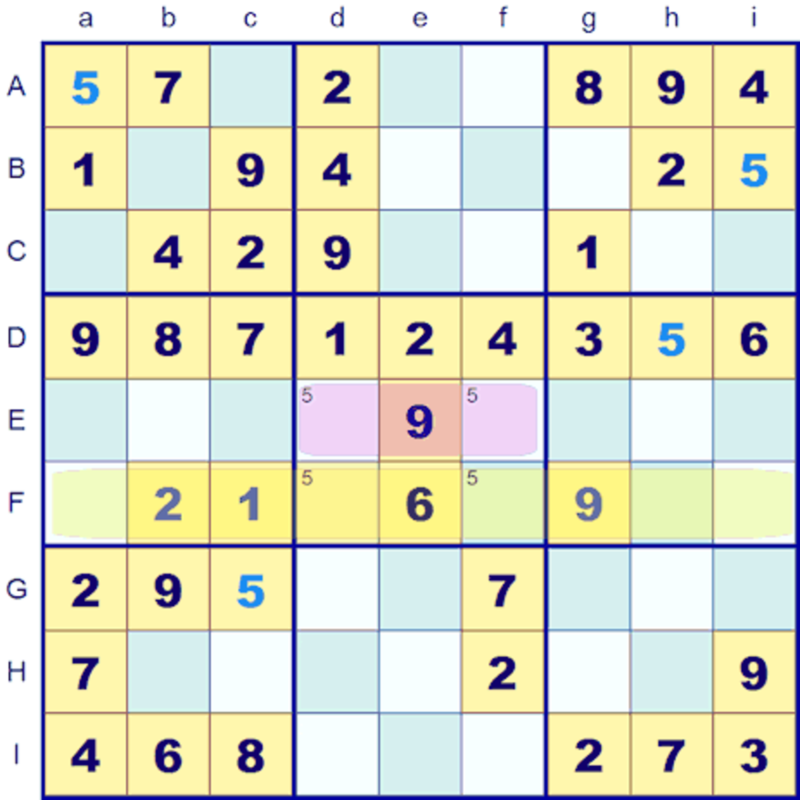 http://skillsudoku.com has free online sudoku puzzles where you can practice and improve your sudoku solving skills. 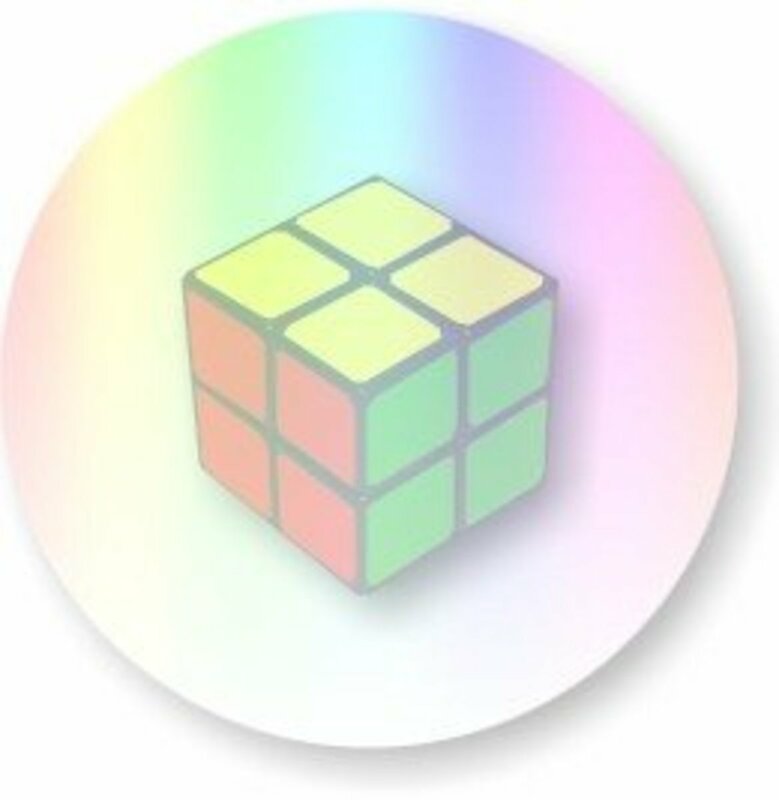 Its a website with a simple design that allows the user to focus on the logic of puzzle solving. I agree. I don't get it either. I've read through the Hidden Twin rule and I just don't get it. I follow the logic of the rule, but the picture doesn't seem to match the text. First of all, the text says, "Look at the upper left box, where 2 & 3 must go somewhere in the region, but can only go in column 'a' since column 'b' already has both 2 & 3." Only column d has a 2 & 3. The only number populating column b is a 4. Also, the text says "look at the upper left box," but it's the lower left box that's highlighted and the number already filled in (4) is bright yellow. Elsewhere on this page, that yellow highlight is used to illustrate the active row or region under consideration. But this is the lower left box, not upper left. Am I crazy? I'm sorry if I'm dense, but I really want to understand the move being explained, but I keep thinking that something is off. wow! i never thought there were laws and rules in sudoku! Interesting!